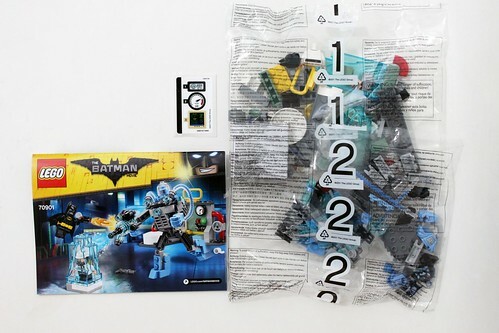 Continuing with my reviews of The LEGO Batman Movie sets, the next set up for review is Mr. 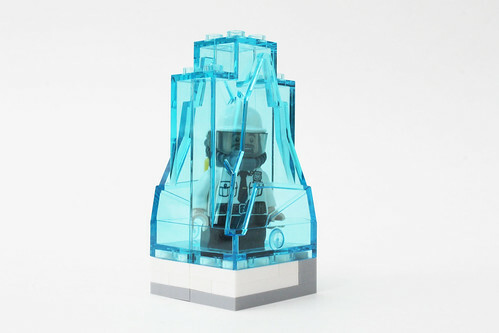 Freeze Ice Attack (70901). 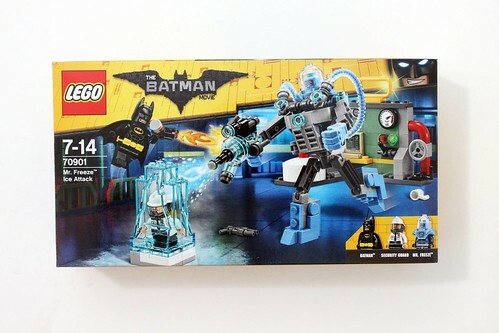 It has 201 pieces and retails for $19.99 which is one of three The LEGO Batman Movie sets at this price point. The contents of the box include two numbered bags, a small sticker sheet, and the instructions. 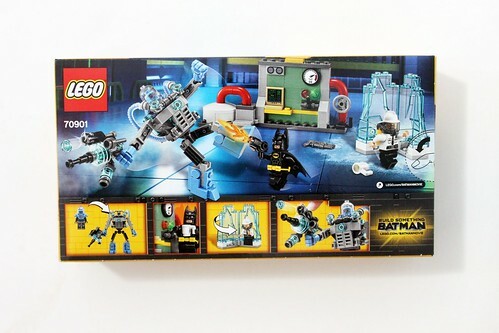 Batman again appears in another set. We’re used to seeing him in a unique suit when going up against Mr. Freeze but here, he has his normal black outfit. The double-sided head has a smirk on one side and an angry expression on the other. This head isn’t unique as it is also in a couple of other sets. 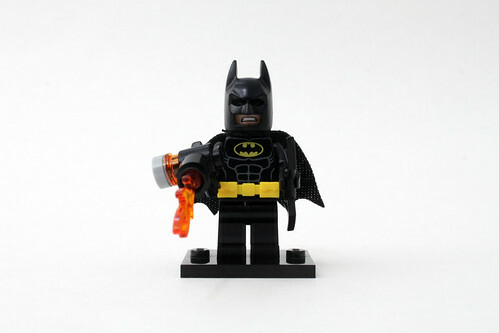 His accessories include a Batarang as well as flamethrower. Mr. 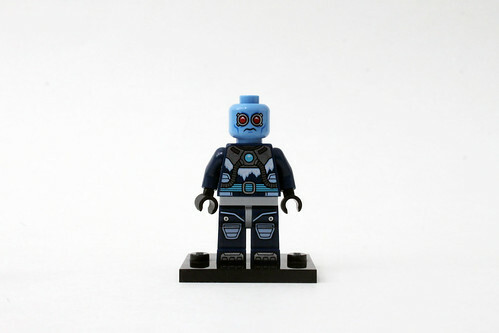 Freeze has a very detailed dark blue torso with some emtallic silver for his breathing apparatus. The legs are also detailed with some kneepad and boot printing. 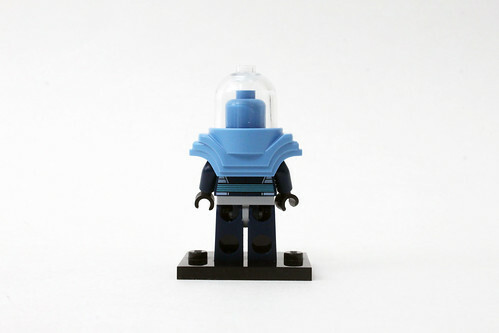 The large armor piece is medium blue color that looks good over the dark blue. The head piece is also medium blue with some red for the googles. There’s also the clear domed piece fits over the armor piece perfectly. 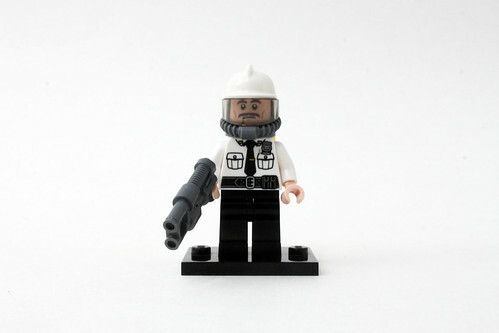 His accessory is a brick-built freeze gun that has a stud shooter. It’s rather large for Mr. 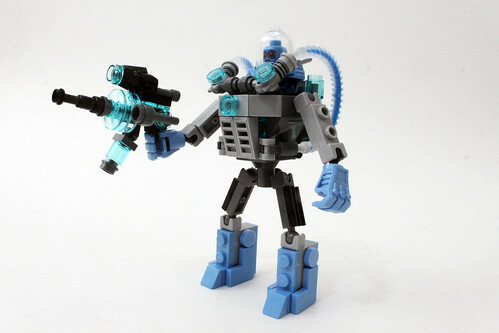 Freeze himself as it is actually designed for his mech. Finally, we have a Security Guard. The torso is pretty generic but it does have some good detailing on it like the tie, belt, and badge. It also appears in the Scarecrow Special Delivery (70910) which I’ll go more into later. He has a double-sided head with a frown on one side and a scared one on the other. He wears a breathing apparatus that is covered up with the hat. 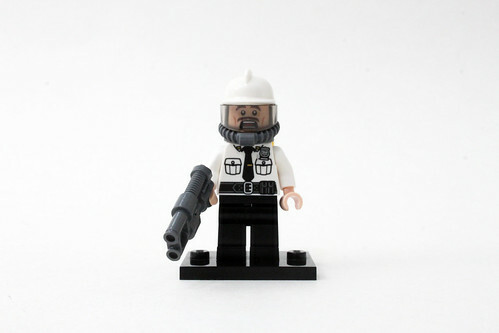 His accessory is a double-barreled gun. There are three parts to this set build. The first one is a block of ice that is used to capture the Security Guard. 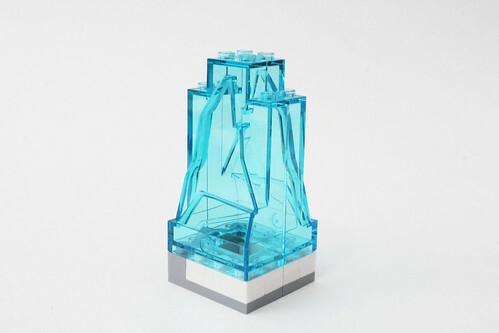 It uses some trans-light blue rock elements that opens up using hinges. The next part of the built is another part of the Gotham Energy Facility. This section looks like the control room of the facility. The wall has some printed pieces to give it some detail like the computer and pressure gauge. There’s also a lever with red and green lights. On one side, there’s a valve along with some red piping as well as a hinge to connect to the other sections. The other side of the wall has a little silo with more piping. 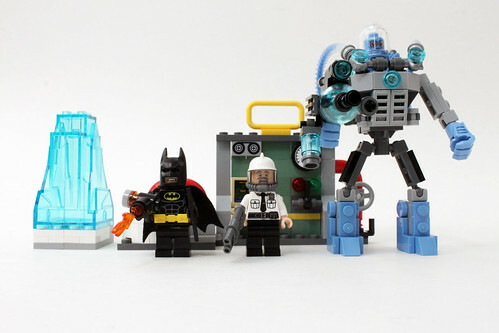 The rest of the pieces for this set is for Mr. Freeze’s mech which is only a few more than the section for the Gotham Energy Facility. The core of the mech is based around the new element that has hinges and ball joints. It also allows Mr. Freeze to stand in it while also having a control panel. 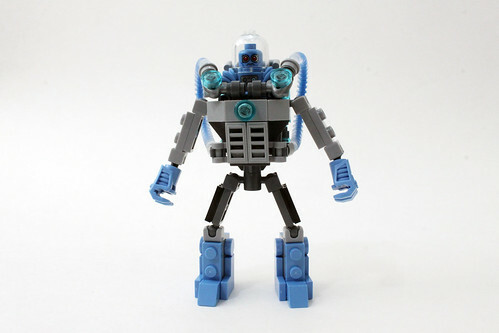 This new element will also be available in some upcoming < a href="http://www.thebrickfan.com/lego-nexo-knights-winter-2017-official-images/" target="_blank">LEGO Nexo Knights Battle Suits. The front of the core has some parts to create the armor. On the top, there are a couple of blue hoses that wrap around the torso. 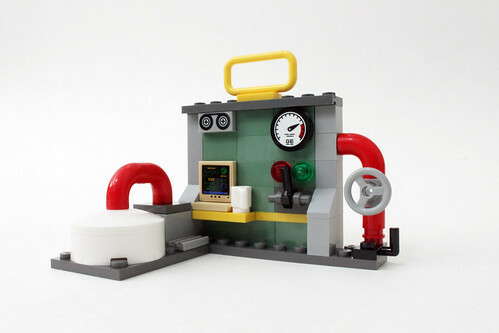 On the back, there are some trans-blue round bricks to possibly represent some cooling liquid that is used for the hoses. This whole back section is on hinges so you can open it up to put Mr. Freeze in. There’s a handlebar piece to keep him secure. There is a pretty decent amount of articulation since all the joints are on ball joints including the arms, wrists, legs, and knees. The waist is able to rotate a full 360 degrees. 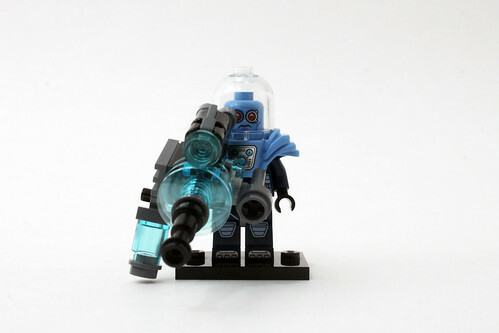 The hand piece is connected with a Technic ball joint and it can hold Mr. Freeze’s gun with ease. I think the gun looks much better with the mech than with Mr. Freeze himself. 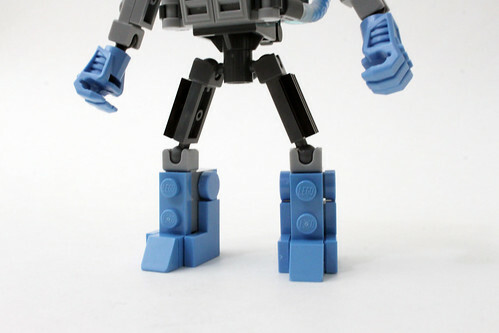 The mech’s feet are perfectly proportioned as it provides stability when it is posed. I do like the SNOT look of it minus on the shins. 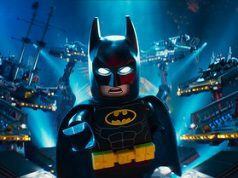 Overall, The LEGO Batman Movie Mr. 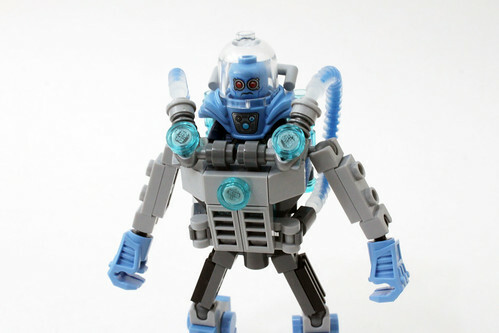 Freeze Ice Attack (70901) isn’t actually that bad of a set. 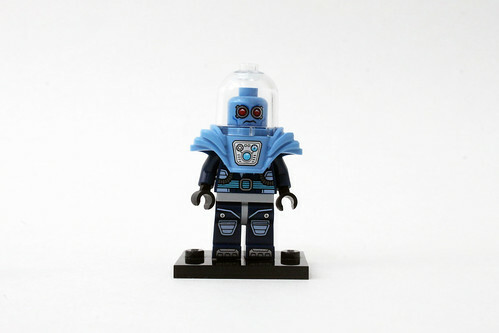 The main feature here is Mr. Freeze’s mech which, in my opinion, is the perfect minifigure-sized mech. 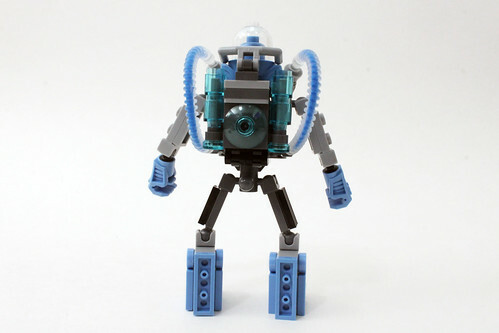 I’m sure we’ll soon be seeing more minifigure-scale mechs using the new element. 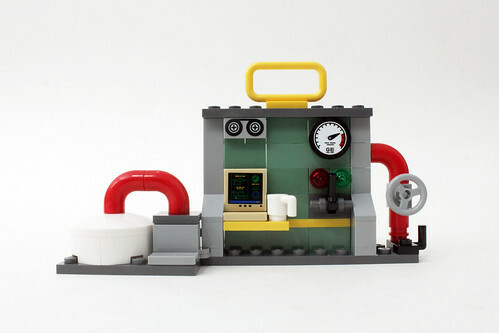 The addition to the Gotham Energy Facility adds more to the playability if you have the other sets to connect to. 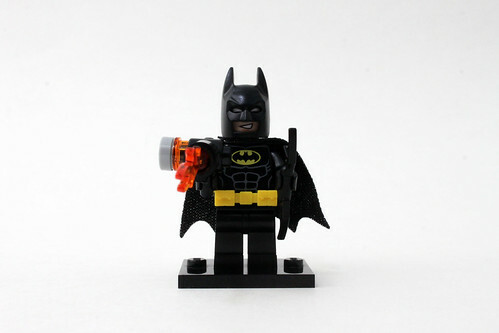 The thing I didn’t like and you’ll know if you have a few of The LEGO Batman Movie sets, you’ll be getting a lot of the same Batman minifigure. Although some of them have slightly different faces, the outfit is the usual black one which gets kind of boring. A variant of him, especially when fighting some specialized villians like Mr. Freeze, would have been nice. Thank you to LEGO AFOL Relations & Programs (ARP) team for sending in this set for me to review. The content above represents my own opinion and not the company. Review sets sent in does not guarantee a positive review.